Many years ago a French writer Charles Perrault wrote a fairy-tale “Little Red Riding Hood”. Everybody knows that according to the plot of the story a kind little girl meets a crafty angry Wolf on the way to her Granny when wants to bring her cakes. By the plot a hungry fearful Wolf eats Little Red Riding Hood and her Granny, making children who listen to the story be very sad or even letting them cry. So the authors of the new version of the play from the Philharmonic Society for Children and Youth decided to drive a cruel Wolf away from the fairy-tale. And young visitors will help them to do this. 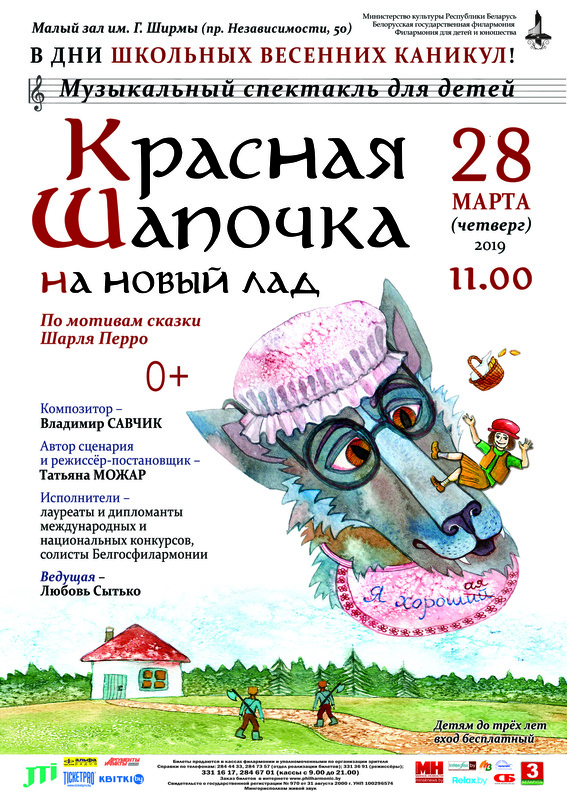 The result you will see watching a musical fairy-tale “Little Red Riding Hood” on the stage of the Belarusian State Philharmonic Society.